Every cinematic P.I. has that one piece of costuming that defines their screen image: Humphrey Bogart’s Sam Spade had his fedora, Jack Nicholson’s J.J. Gittes had that nose bandage and now Liam Neeson’s Matt Scudder—the gumshoe at the center of the New York-set crime story A Walk Among the Tombstones has the turned-up collar on his brown winter coat. Whenever the jacket goes on, the collar goes up; it’s practically a ritual, one that puts in place an essential piece of the character’s armor. It’s also a good look for Neeson, who already cuts an imposing figure onscreen, but practically resembles a mythical champion when stalking down a New York street with that coat trailing behind him like a cape. He doesn’t need Batman’s cowl or Iron Man’s suit of armor—he’s already a superhero. 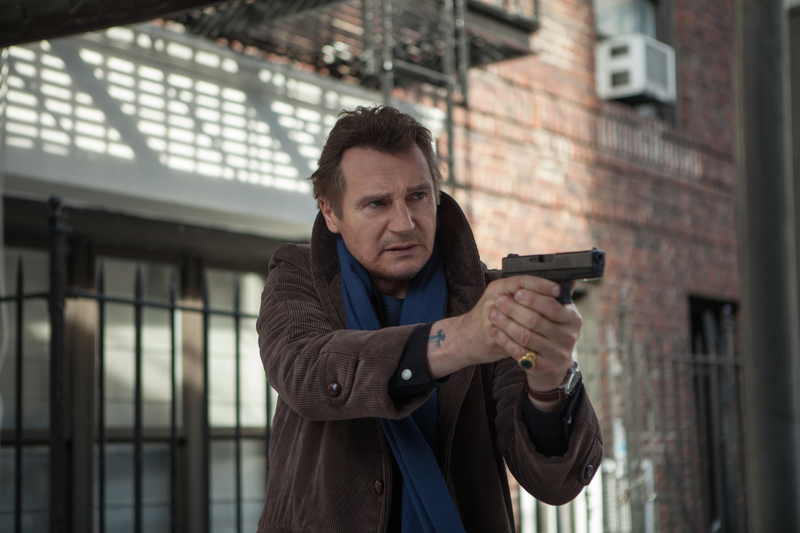 The Irish actor’s late-career rebirth as an action star in movies like Taken and Non-Stop has been fun, if a little odd to witness for those of us who grew up watching Neeson in roles as varied as Oskar Schindler or Rob Roy. And while those newer action vehicles take advantage of his size and air of casual menace, they’re largely brawn-over-brain pictures that rarely allow him to show off his keen intelligence. (Then again, the Taken movies are so relentlessly stupid, it would shatter the illusion if Neeson didn’t play dumb as well.) Tombstones—a movie that Neeson used his newfound earning power to get produced after it spent a decade or so in development hell—tips the scales back in favor of the latter. Don’t worry, Neeson still does beat up some very, very bad men, but that happens much later in the proceedings. The majority of the movie is given over to a mystery that Scudder can’t simply fight his way through, blowing up half a city in the process. Instead, he’s got to pound the pavement, ask some questions and piece the clues together—he’s building a case instead of just painting the town blood red. If only Scudder was using his brains to solve a halfway-interesting case. Tombstones is written and directed by Scott Frank, who has written a number of great crime pictures over the years, including Barry Sonnenfeld’s Get Shorty, Steven Soderbergh’s Out of Sight and The Lookout, which Frank himself helmed. He’s got an obvious respect for the genre, as well as the source material, which is one entry in a detective series by celebrated author Lawrence Block. But right from the get-go, there’s just something flat and perfunctory about the way this narrative unfolds. The stakes are these: two sickos located somewhere within the New York City limits has been killing women in stomach-turning ways. The latest victim is the wife of a drug dealer (Dan Stevens) and, in his grief, he enlists Scudder—a recovering alcoholic who quit booze around the same time that he quit the NYPD—to locate the guilty parties so he can enact his own personal vengeance. Although he’s understandably reluctant to partner up with a known drug runner, Matt takes the case once he realizes just how twisted the killers are. His ensuing investigation moves him around the NYC map, from Red Hook, Brooklyn to Washington Heights, Manhattan. Along the way, he gains a pseudo-sidekick in the form of transient teenager, TJ (Brian “Astro” Bradley) and more than a few cuts and bruises as he closes in on his targets. Maybe it was too much to expect a mid-level programmer like Tombstones to come close to resembling a classic of the genre like Chinatown, which is about more—so much more—than its central mystery. But it’s not even a fun yarn like The Maltese Falcon or Frank’s own The Lookout, where the narrative at least impacted the characters in fundamental ways. In contrast, Scudder and, in turn, Neeson almost exist outside of the events of this movie: he floats above the fray, displaying an almost casual disregard for what’s happening around him. And because he doesn’t seem to care, it’s hard for us to really care. That could be read as a criticism of Neeson’s performance, I suppose, but I think it has more to do with the fact that he’s crafted a character who is far more interesting than the narrative he’s been plugged into. Put another way, Neeson is performing the version of Tombstones that’s a character study and Frank is directing the version that’s a mean streets crime movie. The former is great, the latter is only okay and they never meet in the middle. Cannily released on the same day as Dan Stevens’ big-budget Hollywood debut in A Walk Among the Tombstones, the indie thriller The Guest gives the former Downton Abbey cast member, who left that series in violent fashion a year ago, his own star vehicle. 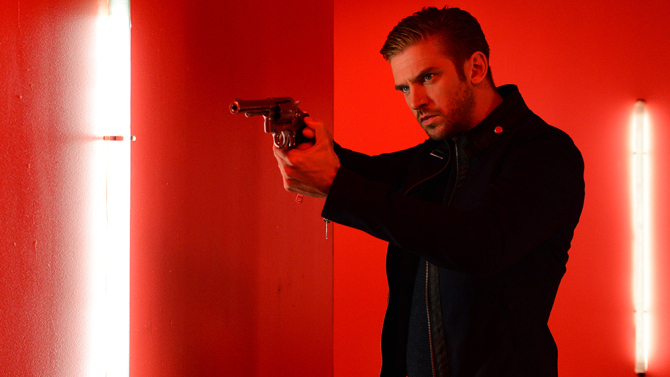 And if Tombstones suffers from a split personality, The Guest knows exactly what kind of movie it wants to be. It doesn’t always employ that knowledge effectively, mind you, but it does move more confidently—and with much more humor—than Stevens’ other new release. The actor himself seems to realize what a plum role he’s landed here and makes the most of it, playing his character, returned veteran David Collins, as a wickedly amusing cross between the Terminator and Jason Bourne. David arrives in a small Southwestern town under the pretense that he’s paying his respects to the family of a fellow soldier, who died in Iraq. Once in his buddy’s house, the family finds it difficult to let this kind-hearted, good-looking stranger go, especially after he manages to provide each of them with what they need, whether that’s someone to talk to (like the grief-stricken mother) or a highly-skilled bodyguard from the school bullies (like the tormented brother). The only person not won over by David is daughter, Anna (Maika Monroe), and her suspicions prove accurate when it emerges that he is a soldier…but not necessarily one from a known branch of the U.S. army. The Guest is the latest film from Adam Wingard, who previously directed one of my favorite segments in the horror anthology V/H/S, as well as the 2013 home invasion picture You’re Next, which I didn’t care for as much as everyone else seemed to. My main objection to You’re Next was the largely terrible ensemble, none of whom were able to show off screenwriter Simon Barrett’s uneven script in its best light. The Guest‘s screenplay has its ups and downs as well, but the quality of the acting is significantly better, from Steven’s live-wire lead performance (seriously, if he’s able to maintain this level of intensity in his post-Downton career, than it’s just as well he bailed on that show’s meandering fourth season) to Monroe’s expert channeling of ’70s-era Jamie Lee Curtis, who famously worked with the director that Wingard and Barrett have pointed to as a major influence, John Carpenter. Carpenter’s seriocomic spirit is most keenly felt in the extended bloody climax, which begins at the family’s ranch house before shifting to a haunted house-themed high school dance. Improbable? Sure. Silly? You bet. But at least it’s fun to watch, unlike the embalmed proceedings in Tombstones. NYC Film Critic is powered by	WordPress 4.2.23 and delivered to you in 0.182 seconds using 35 queries.